Everyone experiences lapses in memory from time to time; we've all walked into a room and not been able to recall why we entered it in the first place, or forgotten the name of a person we've just met. These moments of memory loss are a normal part of being human, and not usually a cause for concern. Sometimes though, memory lapses are not so easy to shrug off. 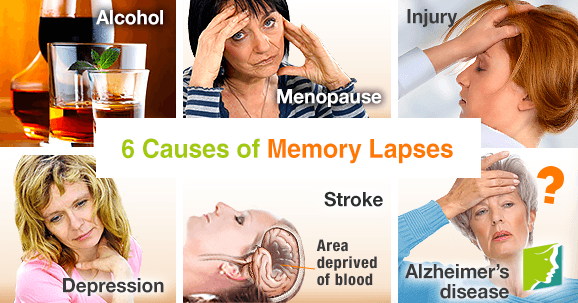 Memory lapses can be symptoms of physical and emotional issues in the body, including serious health conditions. When a person drinks more than four of five alcoholic beverages in one hour, this is known as binge drinking. Consuming alcohol at a faster rate than the body can metabolize it usually leads to intoxication, which can affect the brain's ability to form new memories. Once sober, a person may not be able to recall details or entire events they experienced once intoxicated. This is known as a blackout. Alcoholics and those who regularly drink heavily are likely to experience memory problems in the long term, as alcohol inhibits the function of the hippocampus and frontal lobes - the parts of the brain responsible for memory. Alcoholics also have increased susceptibility to memory-impairing diseases, such as hepatic encephalopathy and Wernicke-Korsakoff syndrome. The brain's functions are closely linked with levels of hormones in the body, particularly estrogen. Estrogen activates different areas of the brain to stimulate its many functions, including the hippocampus. Estrogen also helps blood vessels to dilate, which means the hormone can increase blood flow to the brain and thereby stimulate its functions. As a woman approaches menopause, her estrogen levels fluctuate and decrease, which can cause a reduction in memory function and difficulty in taking in and recalling new information, known as “brain fog”. Injury to the head can cause repercussive long-term memory lapses wherein the sufferer forgets incidents that occurred prior to the injury. Depression, stress, and anxiety often causes memory lapses. Those with depression often have a reduced attention span, due to a lack of interest or distraction preventing them from processing new information in the first place. A stroke cuts off blood supply to the brain, causing brain tissues to die. This can result in lapses in long-term memory where incidents prior to the stroke are forgotten. Alzheimer's disease is perhaps the most well-known example. The earliest symptom of the condition is usually forgetfulness; the patient may experience difficulty performing tasks which require thought, but were previously achievable, such as playing a card game or understanding a new routine. Becoming lost on familiar routes, losing things, and inappropriate social behavior derived from decreased social awareness are also common early symptoms. In severe cases, the condition involves inability to remember words, recognize loved ones, places, and objects, and forgetting how to recognize basic bodily functions, such as the need to swallow or urinate. If you identify with any other symptoms listed in this article, your loved ones have expressed concern, or you are worried about the occurrence of memory lapses, it is advisable to consult with your doctor to rule out any serious health concerns. If you struggle with memorizing things, remember that the cognitive functions in the brain that control memory can be improved; regular reading, learning to play a musical instrument, crossword puzzles, and other brain-training games are fun and effective ways of strengthening memory.